News of changes to the Starbucks Rewards program have been circulating for almost a month south of the border but there wasn't much news for those of us in Canada. That's probably because the Canadian Starbucks Rewards is pretty much just an extension of the U.S. one. Today Starbucks Canada sent out email confirming the changes coming that in Starbucks own press release states they are enhancing the program. If you follow the loyalty industry with even the slightest interest you should be wary of when a program uses the term 'enhances' or 'enhancements' in their headlines. More often than not that means the program is getting worse. Personally I would say that this holds true once again with Starbucks Rewards 'enhancements' to the program. For those of you who have been familiar with the program, and I'm sure it's a lot of you, you collect Stars (2 for every $1 spent) at Starbucks and then you can redeem 125 Stars for any drink or food item on their menu. This easy system was really good for maximizing value out of the Stars collected. Think about it you could redeem 125 Stars for a $3 or a $7 or $8 food item. I always did and still do the latter, to pull the most value out of the program I never redeemed for anything below $5 and most redemptions have been for those food items in the $7 range. Well that's all going to change on April 16 and I think that myself and countless others could be to blame for this change since we were redeeming for the priciest options possible! Starbucks is going away from the 125 Stars for any drink or food item to a tiered reward system which is what they are touting as there enhancement. Sure it enhances the amount of things you can redeem for and has made 'basic' drinks cheaper to redeem for but everything else - the fancier drinks and bigger food products are increasing in price. I don't have stats but just from being in line at Starbucks there aren't a whole lot of people buying basic drinks like straight coffee or tea. Most are buying espressos, refreshers, lattes and the sorts and those are all going up in price for Stars. 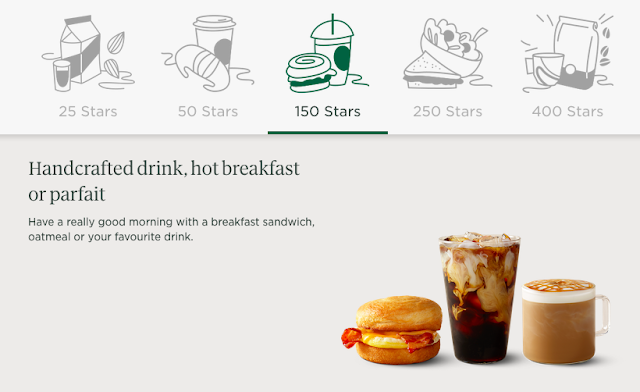 As you can see the most popular drink and smaller food items will now cost 150 Stars. That's 25 more than what we are paying right now. 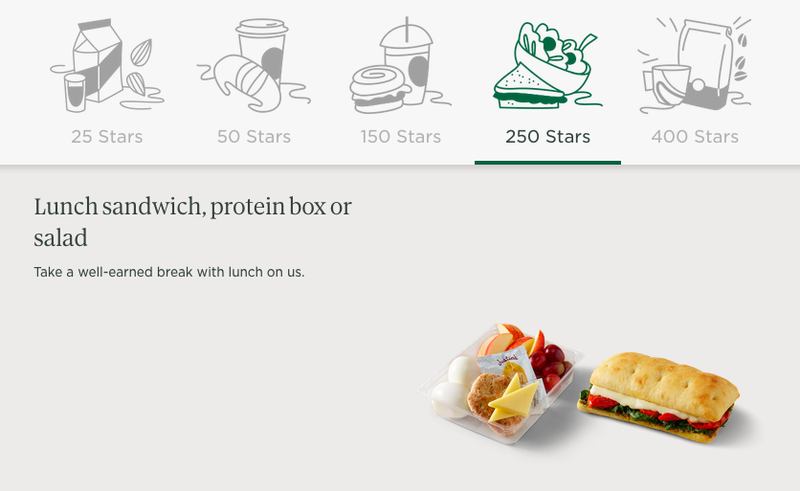 Sandwiches, Salads, and protein boxes see a huge increase to 250 Stars! That's a doubling of the amount of Stars required now yet these items don't tend to cost twice as much when paying cash. And in the U.S. this food option is only jumping to 200 Stars not 250 - while the other new levels are equal between Canada and the U.S. 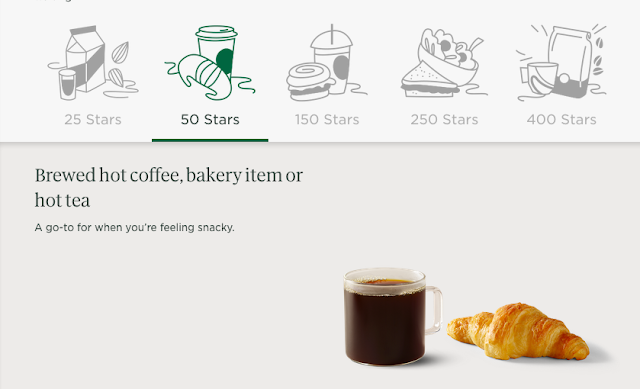 The good news is that basic coffee, tea and bakery items have dropped significantly from 125 Stars to only 50 Stars. That's a pretty decent deal but again these don't appear to be the most sought after items. 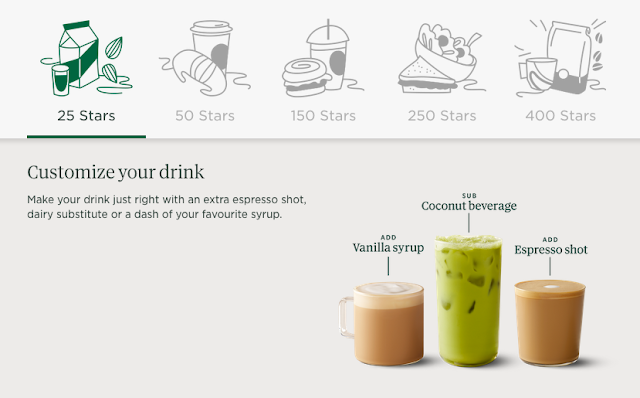 The drink customization redemption option is good I guess simply because it gives another option to use your Stars on. 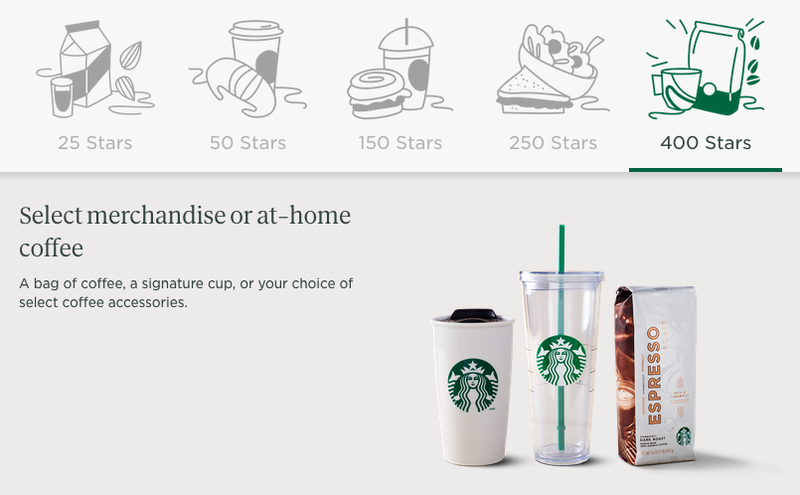 It's also nice to see the select merchandise and at -home coffee being added. 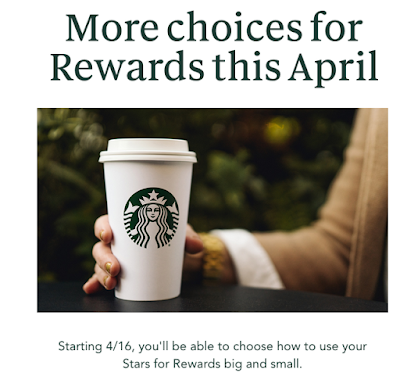 These will run 400 Stars and could be where the most value could be brought out of the new program if you are able to redeem for some of those $25 or so coffee or drink cups. Time will tell if that will be option! Update: Just read further into the terms and conditions and the 400 Star redemption option is limited to a C$20 maximum before tax. As you can see it is both good and bad news coming for the Starbucks Rewards program. For me it is mostly bad as the items I was redeeming 125 Points for will now cost 150 to 250 points. I'm sitting on 12 rewards in my Starbucks Rewards account at the time of writing this that were waiting to be redeemed for food items during this busy kid's activity season. I will definitely be upping the redemptions for anything over $5 during the next three weeks to get the most value of the Stars that have been earned. Even with the changes I will still collect Stars and maybe go on my own advice of "The True Value in Reward Redemptions" and not worry about maximizing the value out of this program and be happy I get free item every once in awhile. And I'll still be collecting 5 Membership Rewards points per dollar loaded onto my Starbucks App thanks to the American Express Cobalt Card. What do you make of the changes? What type of Starbucks collector and redeemer are you? Are the changes better or worse for you? Let us know in the comments below!